Yahoo is known for offering a quite extensive and useful set of services for some time now, which include obviously email but also others that are considered valuable around the world, such as Yahoo Finance, Yahoo Sports, Yahoo Messenger and Yahoo News that bring a lot of informative material to users from reliable sources. 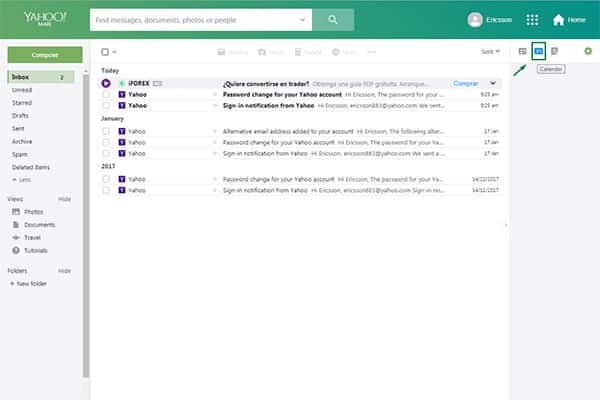 Not being enough with that, Yahoo on its renewal has added some other features and tools that can be used directly through Yahoo Mail as based platform, in order to provide a more integral and general approach of service. One of these instruments is the notepad, as a tool that browsing the web can be very handy at some point to register and save important information. 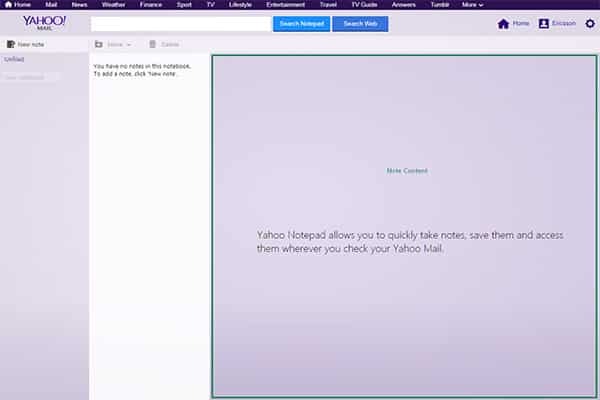 In fact, Yahoo´s notepad takes advantage of cloud features and every note saved will be saved and shown in any devices from which the user log in, local or portable and on real time. In this way, important information kept on the notepad is available anytime, anywhere. Let us talk to you about Yahoo´s notepad in more details and how to use it and take advantage the most of it. 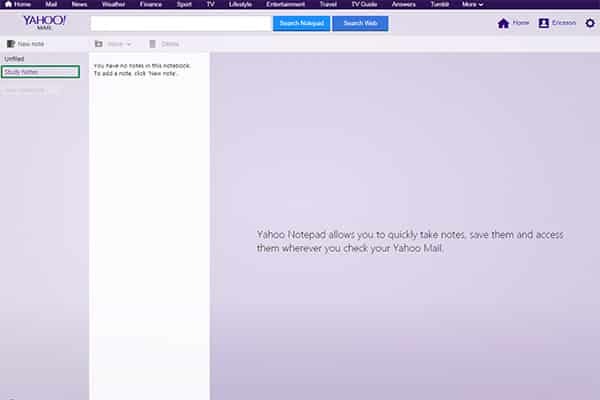 In order to have access to Yahoo´s notepad and take advantage of everything it offers, the first step we must take at least the first time is to open session on Yahoo Mail. To do it, we can access the URL address www.login.yahoo.com and enter the email address and password, getting logged in to the inbox to follow the next steps. 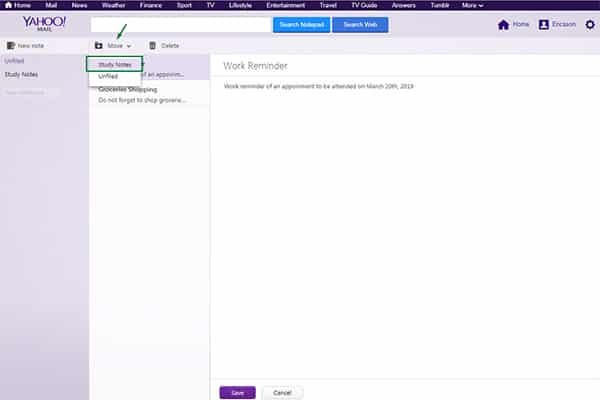 Now that we have opened session on Yahoo Mail and we are looking at our inbox, to access the notepad we just have to click on the icon placed at the right of the screen, along with Calendar and Contacts icon. By clicking on this icon the notepad will be opened on another completely different window or browser tab, depending on if we are using Chrome, Mozilla, Edge, Internet Explorer or Safari. 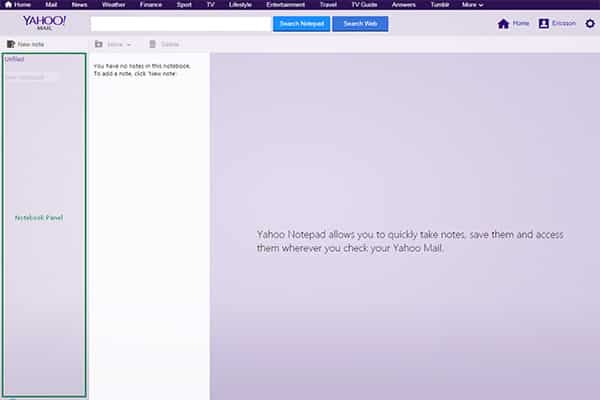 In any case, Yahoo´s notepad will opened independently as another platform, where we can finally start using it. There are a number of great possibilities with the notepad service offered by Yahoo, from the creation of new notes and their editing process to add completely new customizable notebooks and so much more, as easy step we will be following in next. To start using the Yahoo´s notepad we must have clear that there are plenty of options that are quite straightforward, as a platform that is always divided into three main parts; to the very left of the screen we have the notebook panel where default and customizable notebooks are placed. Secondly, more to the center we have the notes panel where all notes from the selected or specific notebook are shown at once and in order. This is particularly useful in multitasking since while we are using or editing a note the others are available on the notes panel at first sight. Thirdly, to the very right and with the most available space we have the content panel, where the text of every selected note is shown in this segment for reading and also for editing. It should be noticed that the content appearing in this part of the layout is only the one included on the selected note on the notes panel. Now that is has been clarified let us start creating new notes. To do so, you just have to click on option “New note” right on top of the notebook panel. By doing so, the editing options will be opened on the content panel to add the note´s name and included text. In this case we will be creating a new note related to a reminder from work, so its title will be “Work reminder” to be entered at the top of the content panel. Then, we click below and start writing the included content or actual text of the note. When we have finished we click on “Save” and it will be automatically saved. Like this, the new note is now saved and available for consulting or editing options listed on the notes panel. On another part, the same way you can create new notes you are able to create new notebooks to save specific types of notes that can be related to work, personal life, reminders, tips, studies or any other. Like this, you as a user can have a more organized notepad that translates into a more useful one that saves time and is more efficient. Now, to create new notepads is even easier than creating notes; just click on the option “New notebook” on the notebook panel and then write the new notebook´s new name and that is basically it. In this case we will be creating a new notebook for study notes. In this way a new notebook is now available for specific use and every new note created while such notebook is selected will be save on it. In case we have created and for some reasons we need to move them to other notepads or simply delete them because there is no more use to them, the process is very simple to carry out. First, we select the notepad where the note is included and select it, by doing so a little option panel will be enabled placed at the top of the notes panel, corresponding to different actions we can perform that will affect the selected note. Like this, the note was easily move from one notebook to the other as a great management options to keep the notepad clean and organized. On the other hand, in case we do not need a note anymore for any reason, there are two easy procedures in which we can delete them for good. The first one will be selecting the note to be erased and click on the “Delete” option, and a new warning will appear asking you if you are sure to perform the deleting process, click on “Delete” again and the note will be deleted permanently. The second deleting process is even more direct and you can do it by clicking only on the trashcan icon that appear when you place the mouse cursor on a note, and like this the platform will ask you if you are sure about deleting it, click on “Delete” and you are good to go. 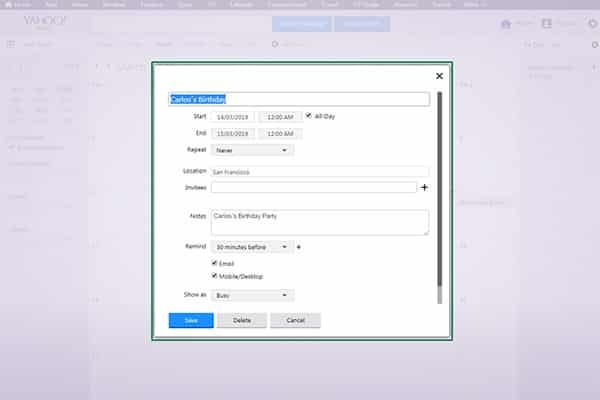 When it comes to modify the notes and their title the process can be done directly by clicking on the note to modify and then on its title or content, enter the new text and that will be it. The Yahoo´s service platform is definitely one of the most useful on the internet right now, offering amazing tools in which users can rely on to perform different task that start from communication and messaging to consulting financial information worldwide and of course, email services. 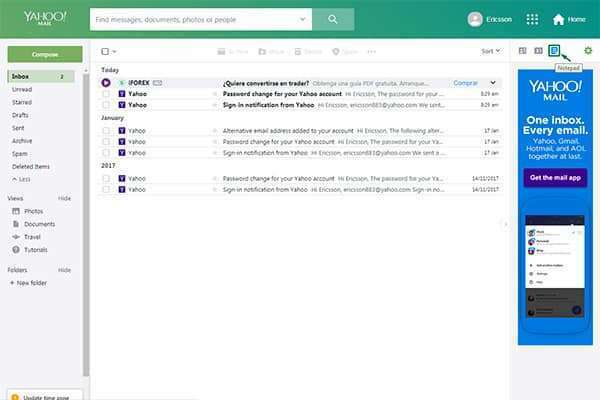 However, through this email platform provided by Yahoo there is other service that can be accessed easily with great advantages; the Yahoo Calendar. Since, email services around the world now involve the use of other advantages and instruments to make the experience more integral and useful, incorporating tools like instant messaging, calculators, folder creation, contact list syncing and calendars, these ones as the important service that allow users to create and schedule events with details of date, time, name, task to be done and more that stay save on the cloud. Today we will be learning how to access Yahoo Calendar directly from Yahoo Mail, how to create these calendars from scratch and the process to add, modify and delete events and their internal information, as a great tool to have at hand every commitment to attend without risk of getting lost. First of all, in order to access the calendar we must be logged in on Yahoo Mail by entering our account and password properly. 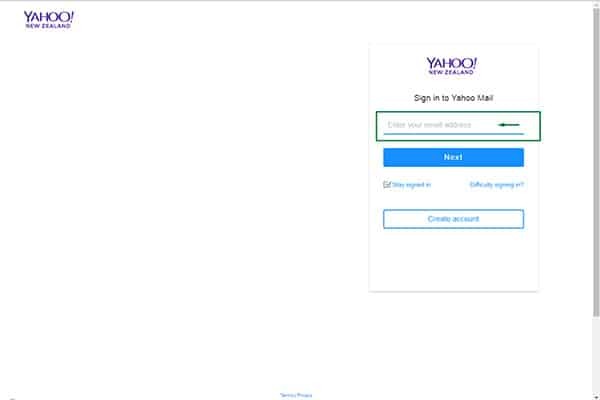 To do so, we just have to access the URL address www.login.yahoo.com using our preferred internet browser and fill in the blanks the required information, such as email address and password. Then we click on “Sign in” and we are good to go. 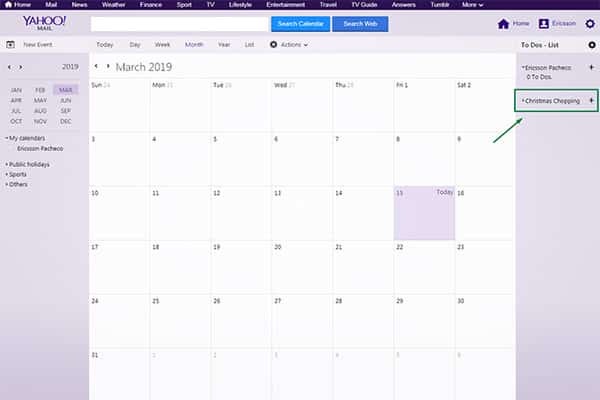 Now that we have been registered and accessed into our Yahoo Platform we are going to be able to use the service, as well as opening the Yahoo Calendar to schedule different events and commitment sorts. 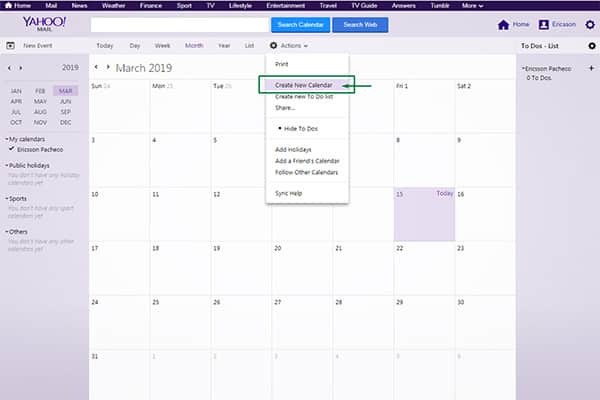 For that to happen, being in our Yahoo platform we will be clicking on the “Calendar” button, which is located on the right of the screen and below the Menu button. Nevertheless, such icon will be pointed with the green arrow for better location sight. 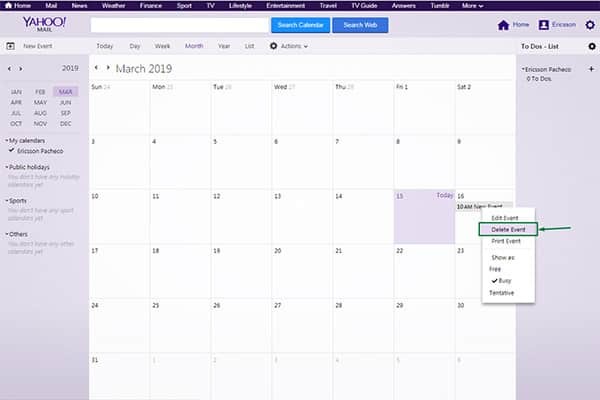 When we click on this button a completely new window or browser tab will be opened, showing us the Yahoo Calendar and all the different options available that we will be reviewing next, with great potential for scheduling and event registration and saving on cloud. 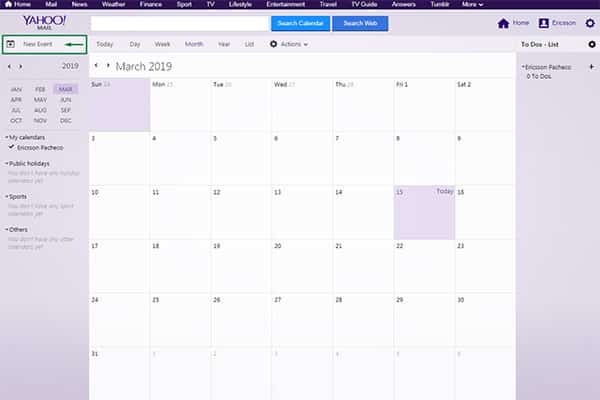 When we use the Yahoo Calendar for the first time we see some viewing options and default settings, in terms on how the platform is shown and the calendars included. For example, there will be only one calendar at this point with the name of the user on it as default, where all new created events will be saved until another calendar is created. The default calendar with your name on it will appear by default in the “My calendars” menu placed at the left. On another part, the default view of the calendar in general is by month and shows the thirty or thirty one days of the month. For many this may be the most convenient view. 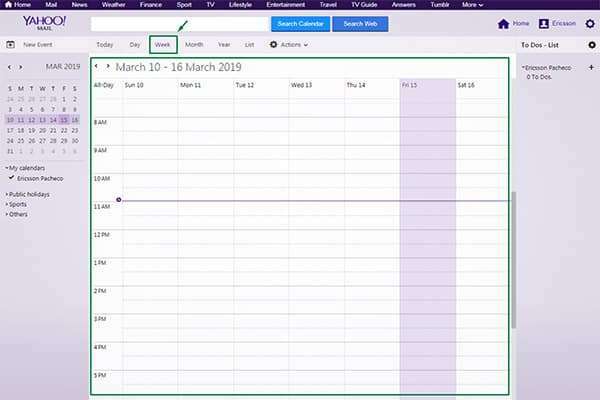 However, by using the folder panel on top of the calendar the user is able to change the view and modify it from month view to Today, Day, and Week, Year or List view according to the user´s choice. 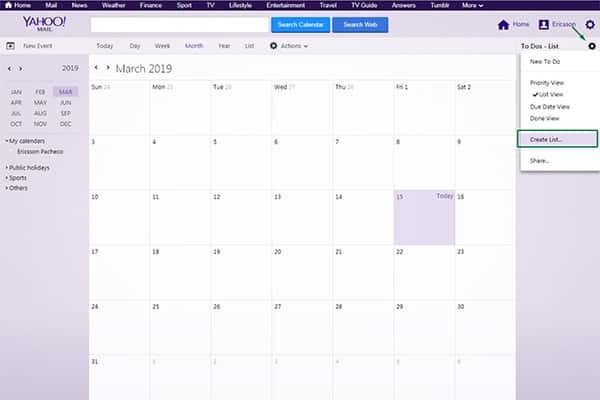 For instance, if we exchange from Month view to Week view the calendar will be showing the seven days of the week, along with the available hours of the day to include new events, being also a convenient viewing option to keep in mind. 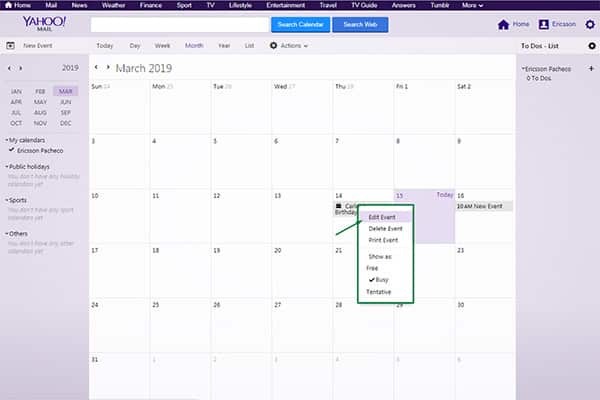 Moving to the right side of the calendar we will be able to see a “To Dos” panel with a default list with our name on it, as the available tool to write different tasks and other things to be done. 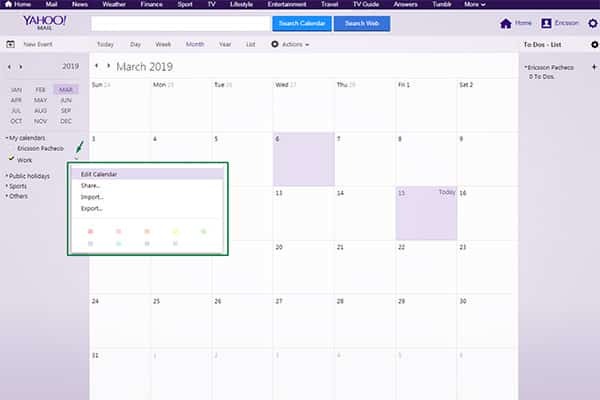 Such panel is possible to be hidden from default viewing layout by clicking on the “Actions” button placed right next to the option panel on top of the calendar, and then clicking on “Hide to dos.” We will talk in more detail about this To Do tool panel later. For a calendar to be useful there must be the option to create new events, and with YMail it results quite easy. 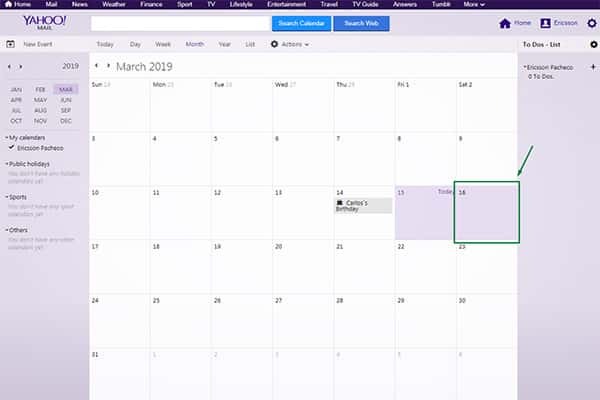 There are two way to do so; the first one is clicking on the “New event” button located at the left of the screen, right on top of the mini-calendar. In this way the event will be saved and showed on the calendar before, during and after it happens. 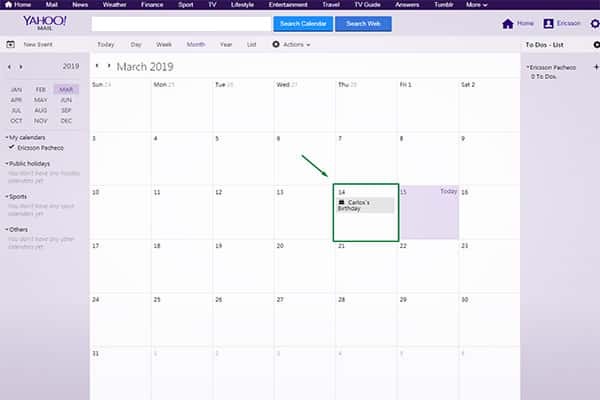 The other way to create new events is more straightforward and simple; just click on the day you want to set the event, then click on the hour of the day the event will be, enter title, location and click on “Save.” In this example we will be clicking on the day March 16th to add the new event. After you have created new events it is possible to delete or edit them very easily. 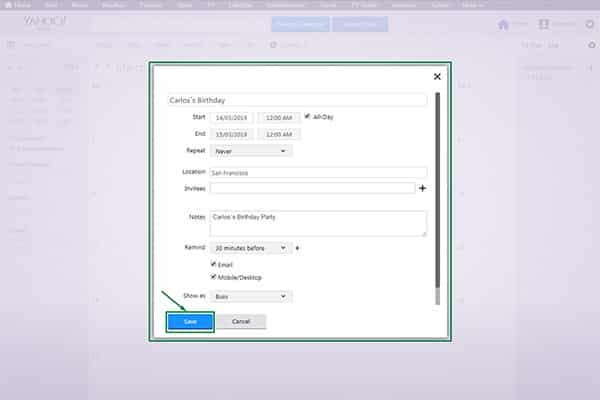 Just click the event you want to modify with the right button of the mouse and a menu will be displayed, and to modify the event just click on the option “Edit event” and a pop-up window will appear to modify every parameter. To delete the event the same process must be carried out, but instead of selecting the “Edit event” option you just have to click on the “Delete event” button and it will be removed. 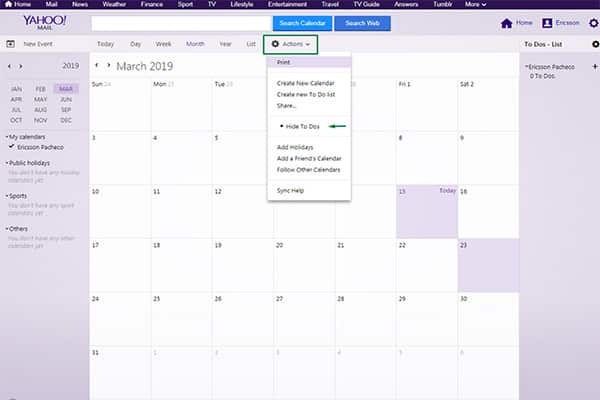 By doing so a new pop-up window will appear to enter the information related to the new calendar, such as name, color to differentiate from others, as well as other options. In this case will be calling this new calendar “Work.” After all the information is entered just click on “Saved” and that will be it, with the calendar appearing right in the “May Calendars” section to the left. 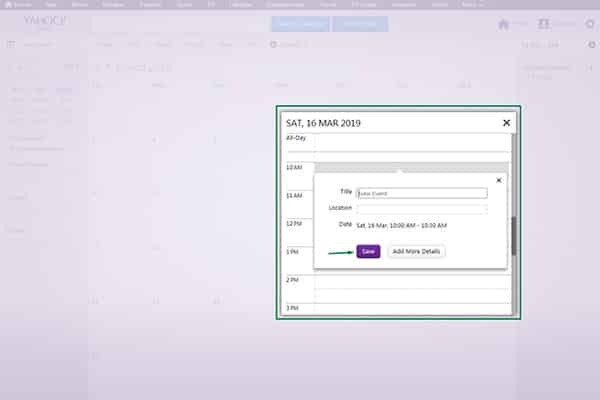 After this process, you may select the calendar you need to manage at certain moment and the one selected will be saving all the new created events. 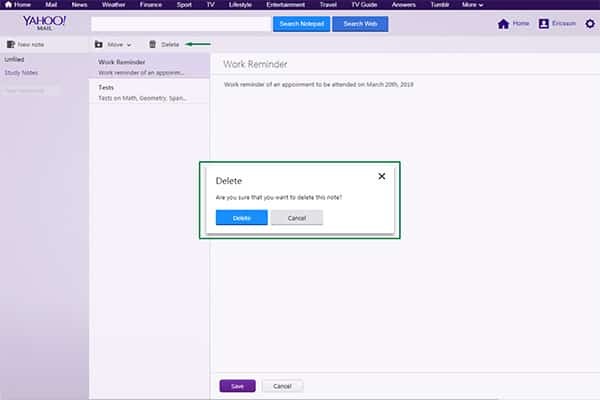 Now, editing and deleting the new calendars is just as easy as it was creating them. 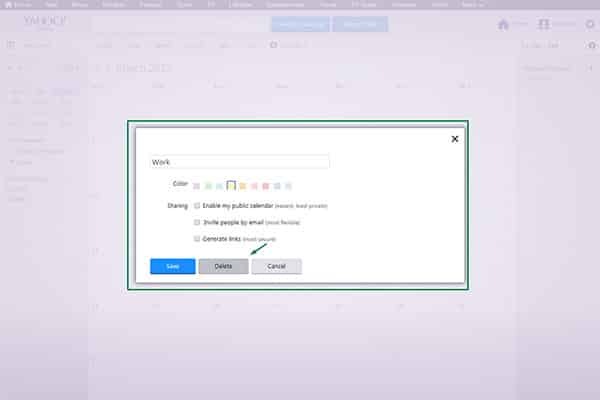 To perform this action, just place the mouse cursor on the calendar to be deleted or modify and click on pointing-down arrow, and then on the displayed menu click on the “Edit calendar” option. 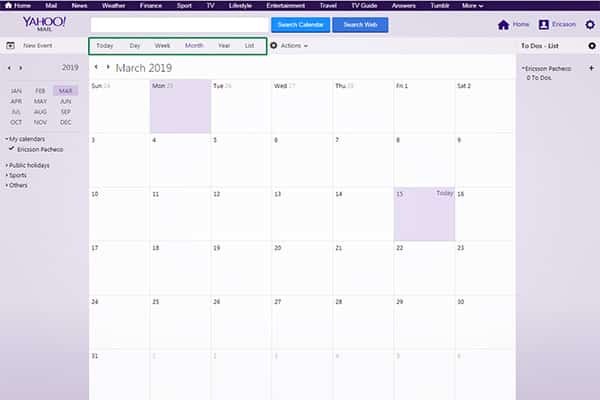 In this way the editing panel will appear, where you can modify name or color of the calendar or just delete it by clicking on the “Delete” option. 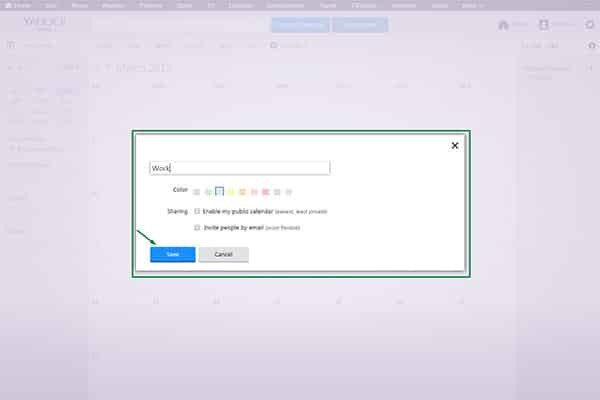 Like this the customizable calendar is deleted, although the default calendar with your name on it cannot be erased. With Yahoo Calendar is possible to create to do list to add different task to be carried out in order. To the left of the screen there is the “To do” list panel by default, with a list created that cannot be deleted with the user´s name on it. By clicking on the “+” symbol on the “To do” list we can add different tasks, appearing a new window to enter the name of the new thing to do, priority and notes. To save the new item on the list just click on “Saved” and it will be included automatically. Then, if we click on the item the platform will translate the action as if such tasks was already done, removing it from the list. 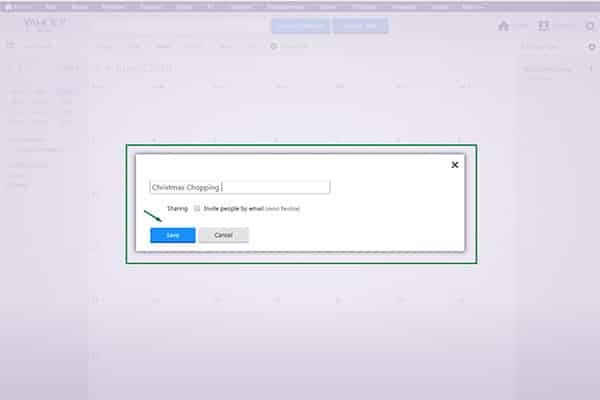 In this way, a new window will appear asking us to enter the name of the new To do list, in this case we will call it “Christmas Shopping” and then click on “Save” to complete the process. Now the new list is included to add items to be completed in order. Email services have become a standard when it comes to the platforms that allow to share important information, documents as attachments and other formal and informal communication, through the web and now having the possibility for these platforms to be managed and utilized with mobile devices and proper apps, such as it happens with the new Yahoo! Mail platform. 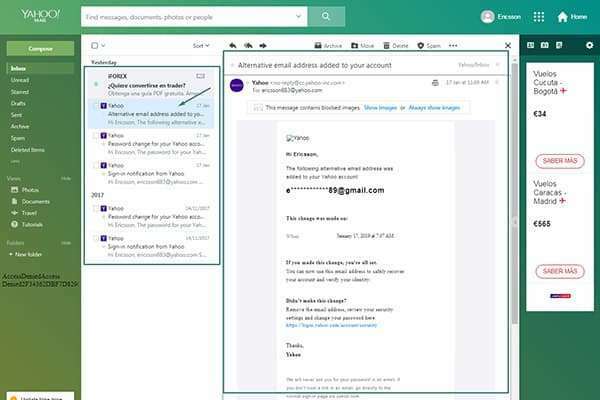 However, at present time users look for more than the simple function of sending messages and attachments respecting the email platforms they use, requiring a whole set of complex possibilities email services must have these days if they want to stand out. So, such possibilities addresses many aspects of the general user experience that help email platforms to be preferred by users in a massive way. For example, folder creation, text editing and several security options to manage are some of the few functions users demand right now respecting great email services. 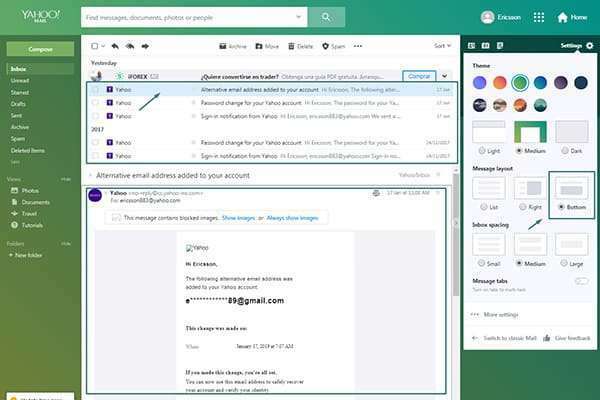 Nevertheless, one of the most valuable functions considered by plenty of people is the possibility to customize and change the different layout and general design of the email platforms of use. With the new version of Yahoo! 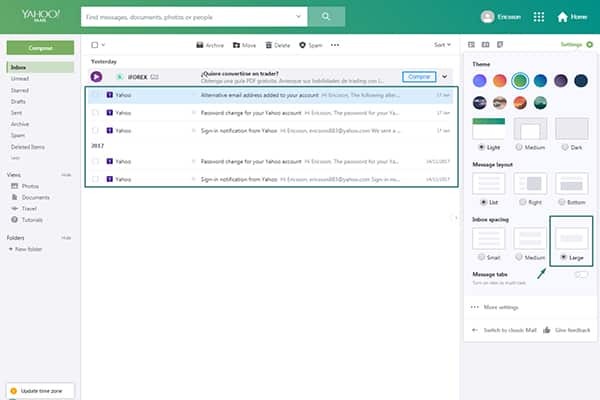 Mail users will be able to adapt and change the design and layout of the platform, respecting the inbox and the aspect of the different folders and areas, giving a more personal feel to the service as something that is considered valuable on behalf of users. Let us tell you how to customize and change the design, layout and color in YMail. After you have been logged in on Yahoo! Mail, you can access the different customization options available. To do so, you may click on the “Settings” button that is located on the upper right part of the screen, right under the “Home” icon. In this way, you will be accessing to the different customization options to change the platform at your own taste and feel. 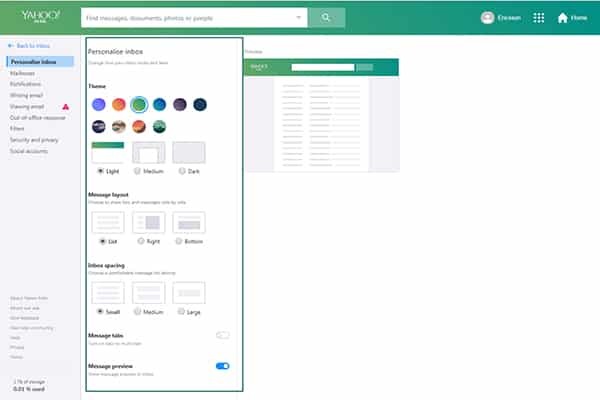 By doing so, a menu will be deployed showing different options to change the design and layout of the platform, from themes to the way the messages are shown and open in the inbox. First, we have the first customization option related to themes in which selecting one of them we will be able to change the color and general theme of the platform. For example, while there are different solid colors it is also possible to select landscape and also lighthouse designs, and such themes are shown on circled icons you can choose by only clicking on them, and the effect will be applied automatically. In this case we are going to select the color green or green theme to change it over the previous dark blue applied before. After we have applied a new theme, we can continue customizing the platform very easily. Right below the theme list, there are viewing options that are designed to make more comfortable the use of the platform depending on the light conditions. To begin with, the default viewing option is “Light” where the platform´s background is completely white. This option is recommended for condition with strong light and use by day. Secondly, the user can choose to other selection respecting the viewing options that correspond to “Medium” and “Dark”, being those the perfect choice for low light conditions or use of the platform by night. By choosing these two options the background will get the color of the selected theme, with no white background except for the “Medium” selection. Continuing, in Yahoo! Mail is possible for you to change the message layout and choose between different choice, which are considered quite valuable by a lot of users since like this they can check emails and their content at the same time without clicking individually on them, as well as enjoying of the traditional list layout. 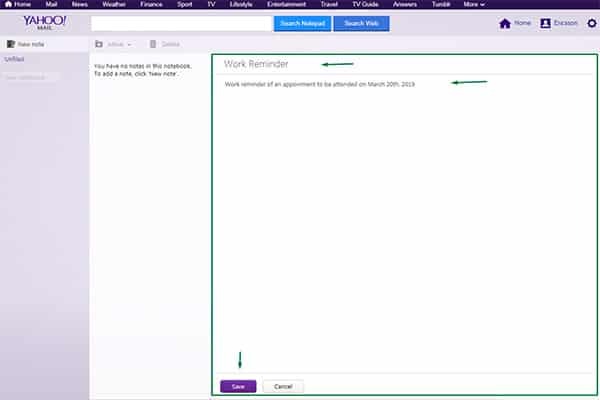 Right below the available themes and viewing options you can choose between three different message layouts: “List” as the traditional view of the emails as a list, which in this case the details and content of every message is not shown, but date and subject. 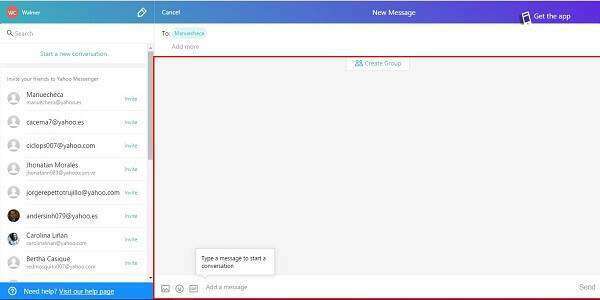 The second message layout to choose is the “Right” option, in which the different messages on the inbox are shown on a small list to the left, and when the user clicks on one message the details and content of such email appear on a panel located to the right. This options is perfecto for those who need to check their inbox faster and not by clicking on every message individually. 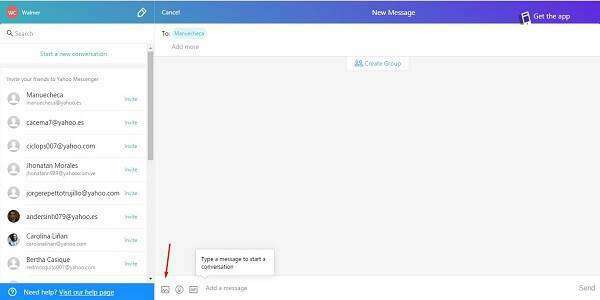 Thirdly, the last option respecting message layout corresponds to “Bottom” as a particular selection users can choose if they want to. 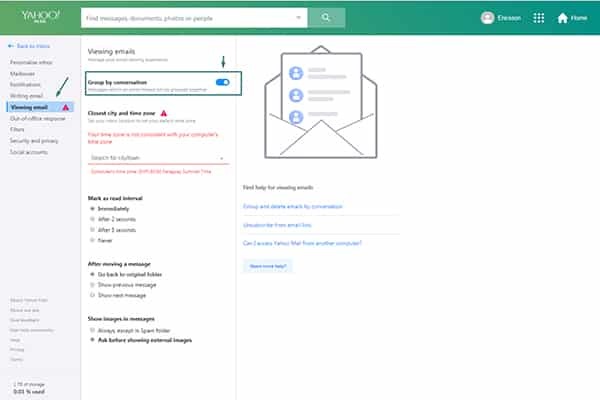 In this case, the different messages and emails will be shown at the upper part of the inbox, and the details and content of the selected message in such inbox will appear right below and similarly to the previous available selection. 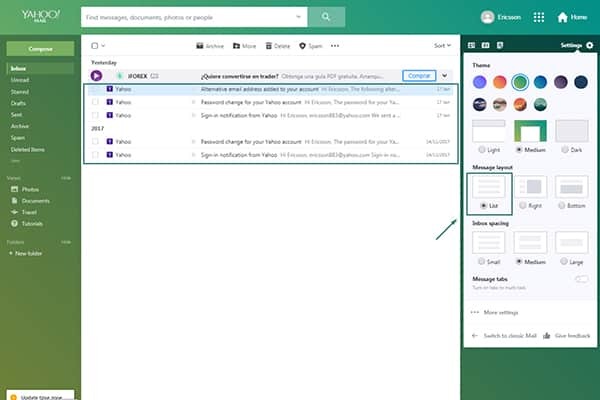 On another part, by using this customization panel the user can change the inbox spacing as a valuable option for those who like to see emails and message bigger or smaller on the inbox, depending on the screen used. 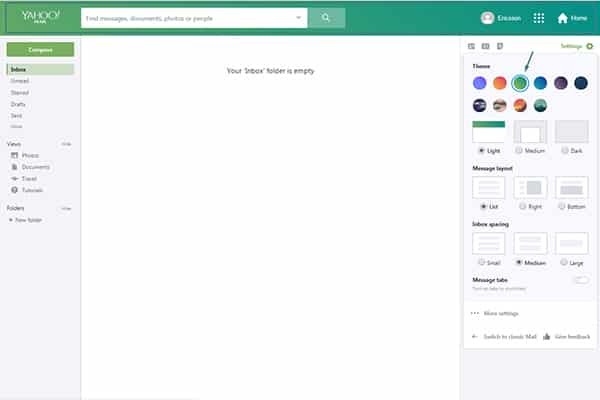 So, it is possible to pick from “Small” and “Medium” to “Large”, and by applying every option emails on the inbox will look bigger or smaller depending on the choice. There are other diverse options on Yahoo! Mail to keep on customizing the platform by the user. For example, on the customization panel right below the inbox spacing options you are able to pick between enable or disable the “Message Tabs” selection, which will turn on tabs to multi-task, and in this way different tabs will be shown above the inbox for diverse uses. In order to access other customization options you can click on the “More Settings” button as the last one placed on the customization panel. In this way, other customization possibilities will be shown as you can see on the Image 16. Since all of these options that are being shown have been addressed previously on this tutorial, the remaining will be the last one corresponding to the “Message Preview”, which show a little preview of every message on the inbox to know what they are about. This option can be enabled or disabled by clicking on the switch placed next to the option. As last customizing option, if you click on the “Viewing Email” option on the general Setting menu it is possible to modify the selection “Group by Conversation”, in which messages within an email are gathered together for better general viewing. This option can be enabled or disabled by clicking on the blue switch. 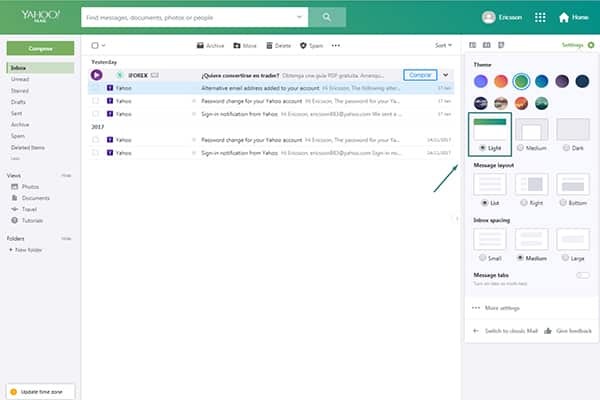 It is recommended to disable the previous option if the user is interested on having a more traditional approach on using the Ymail service, although leaving it enabled will make the message viewing and replying process a lot easier. After the important update from Yahoo! ´s mail platform, which was developed to do a makeover on the decayed image of the company, Yahoo! Messenger has been the next on receiving an important and substantial change, although in the same way it was done with the email platform, it has done it starting from an existing and familiar idea, opting on the known things to be able to recover general trust. To begin with, Yahoo! Messenger on its web version has opted for the Whatsapp chat design for local computers, which many of us already know it consists on a conversation list persistent bar to the left, and the selected conversation remains on the right. Of course, all the found elements are designed with Yahoo! ´s visual language, but its great resemblance is undeniable in comparison to Whatsapp Web platform. 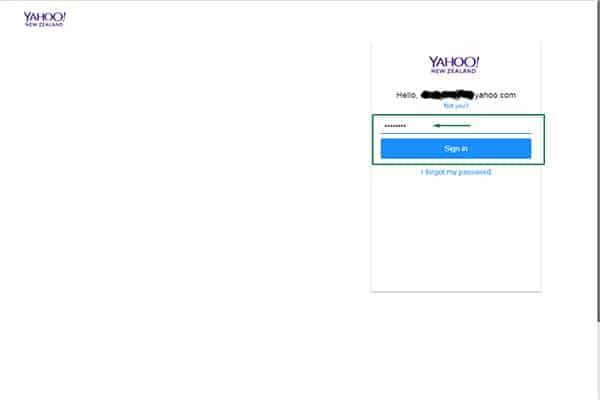 It is possible to access Yahoo! Messenger from the Yahoo! ´s email platform. So, when we access it we will see a direct link on the left side of the screen, which is the designated area to access the personalization menu and the settings. 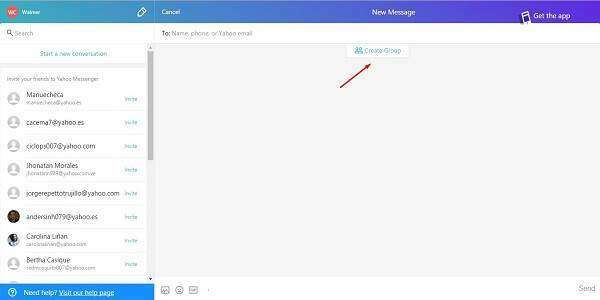 Therefore, in order to access you just have to click on the Yahoo Messenger icon that is located on the left side, along with other icons related with different Yahoo! services. However, keep in mind that by clicking it you will be redirect to a new portal where the platform will be loaded. Nonetheless, not only by this method Yahoo! Messenger can be accessed, but also it can be entered through URL. In so, the Yahoo! Messenger web address online is messenger.yahoo.com, which can be written directly on the address bar of the preferred browser, in order to access the platform. Also, another important fact is if Yahoo! Messenger detects that you are accessing it from mobile browser as cellphones, the program will not be loaded and instead it will show you links in order to download the mobile platform regarding your device, since now the mobile platform is preferred as application, completely independent of the new platform for computers. Yahoo! Messenger has opted for an old known design, which is an almost identical interface from Whatsapp Web, having all the conversations on the left side and the selected conversation on the right side. To start a conversation, you just have to select the contact of the list on the left, opening a new one automatically. If the required contact is not on the list, it is only needed to click on the pencil over located on the top of the conversation list, in order to select the contact of interest and with it, to start the conversation. On another topic, contacts for Yahoo! Messenger are limited to their domain, that is to say, you cannot chat with people who have accounts or associated numbers to foreign services. However, you certainly can invite them to join Yahoo Messenger service. 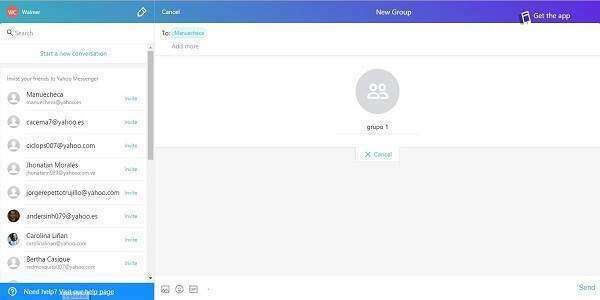 At the beginning, you will find a list of people to invite joining Yahoo! Messenger on the conversation section, which will be substituted gradually with the conversation you are creating. So, to invite one person you just have to click on the send button that appears on the side of your potential contacts to use the service. 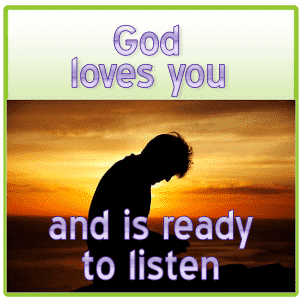 In fact, you can write them and the messages will be delivered when these people join Yahoo! Messenger service. The conversation space is also identical to the one in Whatsapp Web, although it is limited on options like sending images, files, emoticons and gifs. Unfortunately, voice notes are not available right now on Yahoo! Messenger platform. Now, in order to send a file or image you have to click on the referent icon; the system will open a window for you to select the file you wish to send. 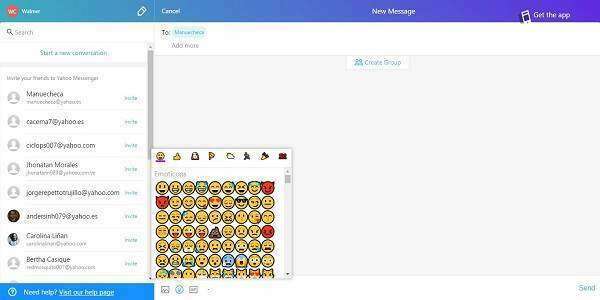 In the same way, to send an emoticon you have to click on the referent icon; the platform will open a window with hundreds of them for you to choose, along with other sections with emoticons performing different actions. 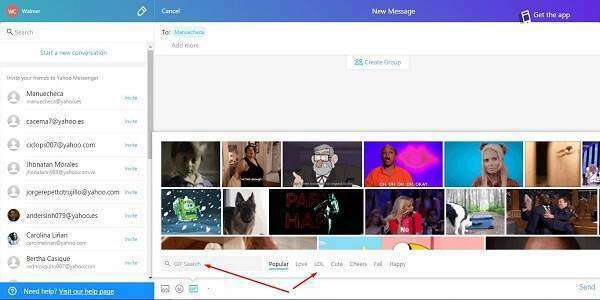 To send a gif, you have to click on the referent button so an emergent window is opened, where you can find the desired gif through key words, and you will be able to send them to your contacts. Also, the platform is capable of working on small screens, adapting to them thanks to a responsive design, which will show a double interface on wide screens and one window interface with squared screens. On the conversations, you will notice that you can create group conversations; on the top of every one of them you will see an icon that allows you adding other contacts to that conversation in particular, making it into a group conversation. In order to do this, you just have to click on the “create group” button that is on the top of the conversation. 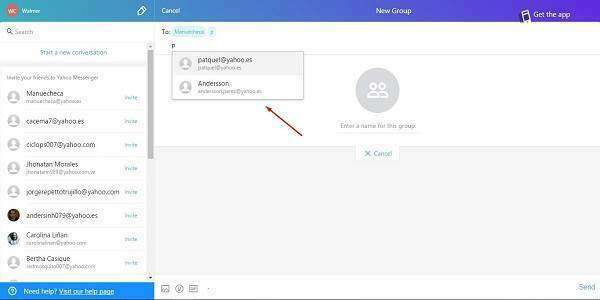 A name must be assigned to the group. Then, a list of contacts will appear on the screen; select the desired contacts and add them to the group. Yahoo! 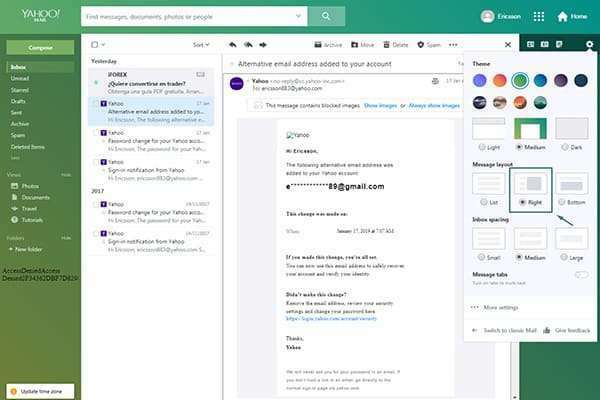 Mail is experiencing one of the biggest and more important renovations in its entire history, and not necessarily being a deep renovation on its functioning, but quite important due to the current condition of the service, where a makeover is really more than urgent. 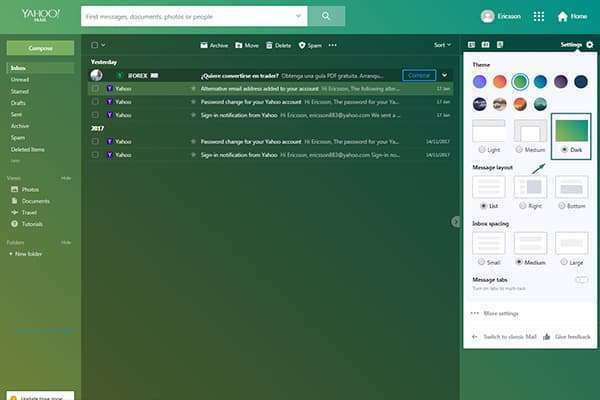 So, Ymail faces a situation where it needs to modernize itself, and the new released interface a few days ago provides that makeover many of us were expecting for, and wanting the presence of functionalities and personalization like the ones on the direct competition. Because of that, many functions have been implemented on the new version, which is possible to activate on our personal account and it substitutes the old interactive mode for good, offering quite more intuitive personalization options, clearer functions and a right minimalistic formula. 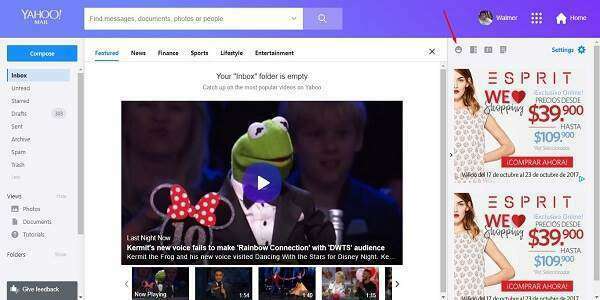 Now, the central element of the new design Yahoo! 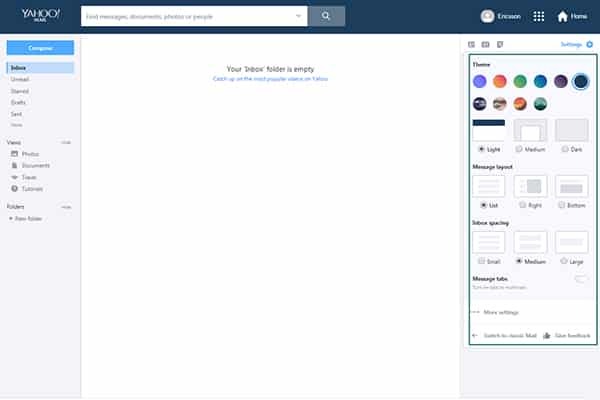 Mail is more adaptable, it is about a space that manages functions beyond showing an email list on the inbox, or showing the content regarding any email we have opened. In details, with the dual viewing integration, tab mode and attachments viewer, this component has become subtly a protagonist. Therefore, functions are carried out according to the selected option. In the same way, to view the elements interactively the viewing modes must be activated from the configuration menu. In so, as predetermined mode the email list is shown and when we click on a specific email, the whole content is opened on the entire central component. 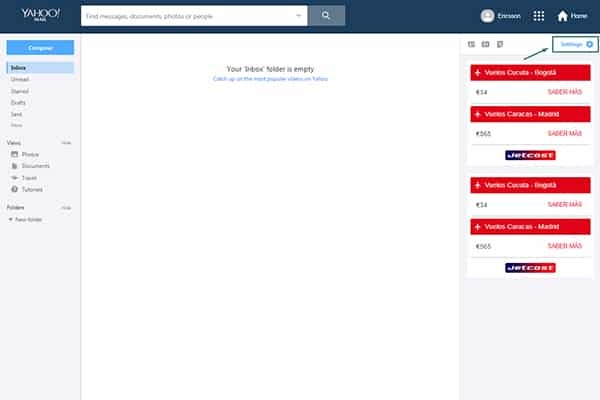 Also, when the viewing option is activated to the right from the personalization options, the central component will be divided into two parts; to the left, the email list will remain shown and visible, while to the right its content will be opened. 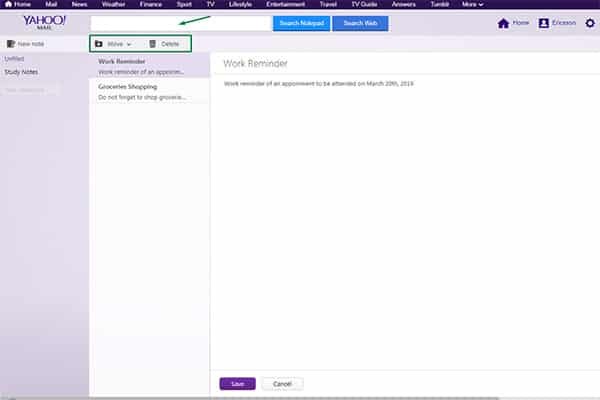 On the other hand, when the vertical viewing option is activated, the email list will remain on the top, and on the bottom will be shown the corresponding content of the selected email. 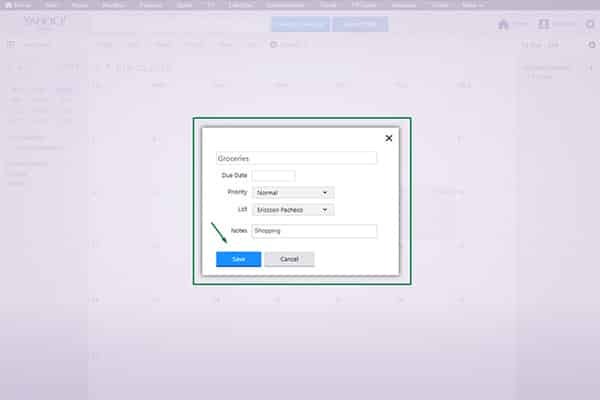 Continuing, the central component is accompanied by a function bar that has the purpose to show different options, which can be interacted with the displayed elements. 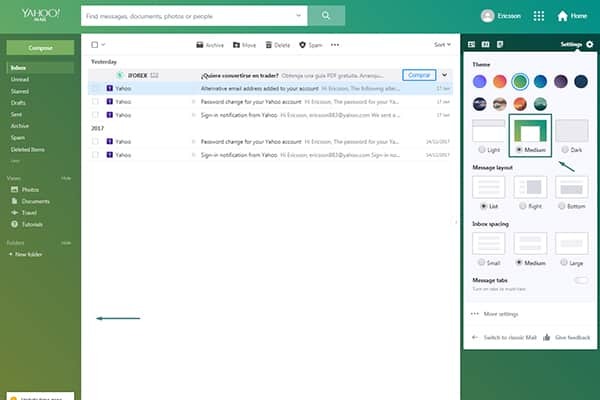 For example, on the inbox visualization or any other mailbox, the available options along with archiving, erasing, Spam selection, among others. Also, inside an email the available options are to reply, resend, reply all, save and others. And, on the photo and document viewing it shows the easy option to manage, although it is hoped the number of functions grow regarding this last two important contexts. Like this, to interact with these elements you have to make sure you are on the proper context, in order to be able accessing options like save, move, mark as Spam, mark as unread, mark as read, stand out, mark removal and see message without format, you must be on the inbox or in a smart view. In the same order of ideas, options like save, move, mark as Spam, mark as unread, mark as read, stand out, mark removal and see message without format are available as well, when you visualize an email, since if you access at least one you will be able to use these functions, which are applied to the email you chose in first place. Along with this options, you will also see the reply, reply this, reply all and forward to other address functions. On top of the contextual function, it will appear the visualization tabs that can be activated from the viewing properties. 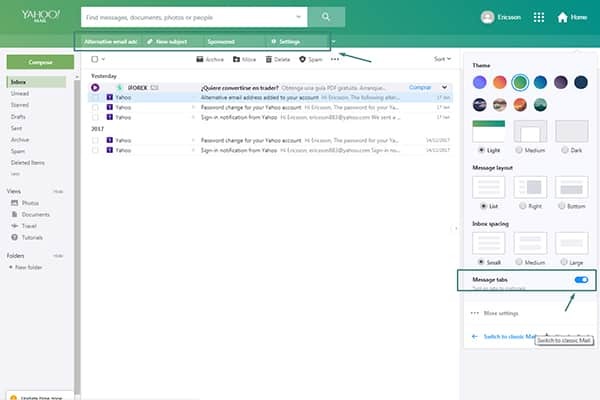 For example, one of the useful things these tabs allow is the possibility to open a big amount of emails, which are placed in an organized way to visualize them one at the time. Thus, to enjoy this option the “message viewing” must be activated from the personalization settings. Therefore, this option is recommended to visualize content on small screen or with low resolutions. 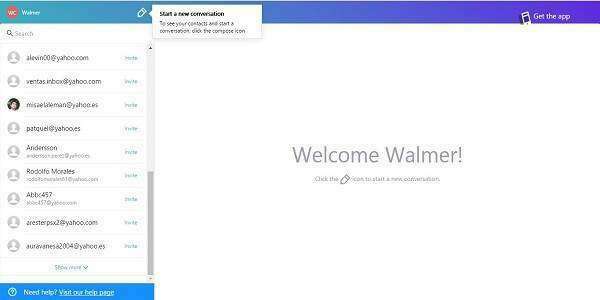 To begin with, Yahoo Messenger is a forgotten Yahoo! Service that does not end up completely abandoned, since it has managed to have a place on the interface to promote its use a little more. When you click on the icon, you will be taken to a specific web site to complete a registration. 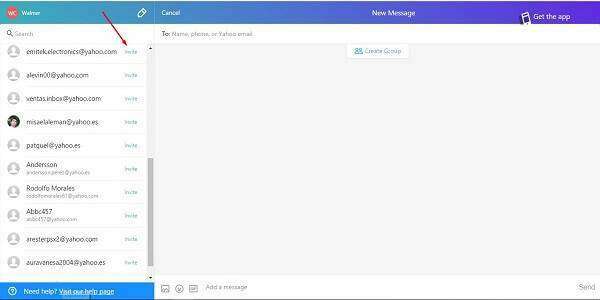 In more details, the service can be used to contact other people in Yahoo! that perfectly can be contacts you send emails frequently. In fact, Yahoo! Messenger could be a valid alternative to compete with Skype, which so many importance has achieved on the productive and business sector. Nonetheless, for the moment the contact icon will lead you to the old Yahoo! Mail version, so you can edit or erase saved contact. Also, something similar occurs with the Gmail contact application, in that way being an existing situation even on the biggest companies of the internet. 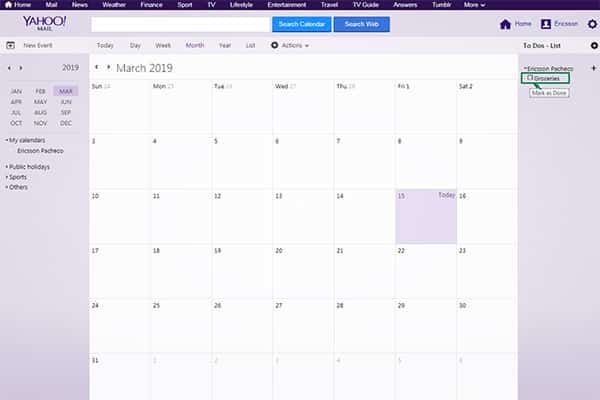 Similarly, the calendar leads you to the calendar application from the old Yahoo! Mail version, which we hope it will get updated soon. Nonetheless, if you already knew adding events on the calendar, you are going to find this entirely familiar, if not, what you must do is to interact with the application to add events to every hour of every day of the week of interest. 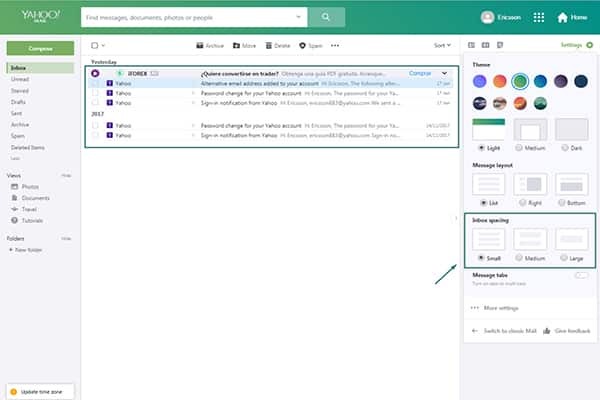 It is hoped that missing elements also receive a definitive makeover, and with it we can leave behind the bad experience with Ymail, coming back great service.